JERUSALEM'S Regency Hotel set the scene for RICHARD CARR and TOBI HAYNE's recent wedding. The couple, who met in Israel after making aliya separately two years ago, were married by Rabbi Chaim Brovender in May. Richard, of Kenton, London, is the son of SHARON and IVOR CARR and works in the telecommunications industry, while Tobi, who works in a kindergarten, is the daughter of CLAIRE and LEN HAYNE, of Melbourne, Australia. The groom's grandmother ZENA PAUL, of Hale, Cheshire, was unable to attend the wedding due to ill-health but his grandfather AUBREY PAUL shared in the celebration. Guests from Australia, England and America attended the simcha. The couple have settled in Katamon, Jersusalem. 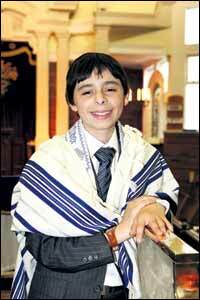 CHARITABLE Benjamin Marks celebrated his barmitzvah at the United Hebrew Congregation on Shabbat. Benjamin, the son of Michelle and Philip Marks, of Leeds, is a pupil at the Grammar School at Leeds. A computer enthusiast, Benjamin spearheaded a sponsored walk up Ingleborough raising almost £800 for World Jewish Relief's barmitzvah twinning programme with Zaparozhye Children's Home in the Ukraine. Grandparents Estelle Marks, of Leeds, and Pam Kirk, of Manchester, together with Benjamin's great uncle, Gene Bard of New Jersey, joined in the celebrations. Guests travelled from Manchester, London and Israel to the simcha. Benjamin has a sister, Rachel, 11, who attends GSAL. 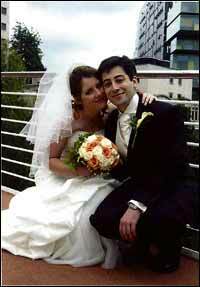 LINA GOLDFARB and Alex Samuels met in King David High School's sixth form when they started on the same day. 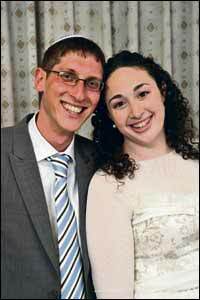 And, almost eight years later, they were married at the Freemasons Hall, Manchester, by Heaton Park Hebrew Congregation's Rabbi Daniel Walker. Music teacher Lina, is the daughter of Irina and Lev Goldfarb, of Kazakhstan, while Liverpool-born financial advisor Alex is the son of Simone and Stephen Samuels, now of Manchester. Best man was the groom's brother Guy Samuels and maid of honour was the groom's sister Ronat Samuels. Guests from Kazakhstan and Germany joined in the celebrations. The couple have settled in Prestwich.